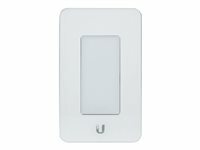 The mFi outlet and switch/dimmer can be integrated seamlessly into any building interior. It features a capacitive touch panel for ease of use. The built-in mechanical relays provide remote powering capability to control energy consumption. The mFi switch/dimmer features a dimmer control to adjust the power level. Use the power metering capability to easily monitor the energy consumption of connected devices and significantly reduce energy costs. The mFi outlet and switch/dimmer readily connects to any Wi-Fi network.